As the Centenary of Anzac approaches communities are preparing their special ceremonies to honour those who served and those who gave their lives. At Gilgai, near Inverell, a Service will be hald at 8.30 am on Anzac Day. There are other activities planned and further information can be found on the Gilgai Hall and Recreation Reserve Trust website. 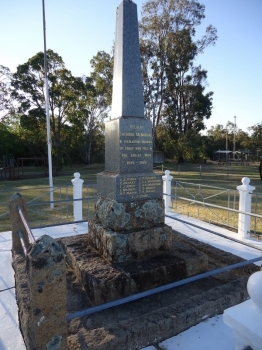 The Gilgai War Memorial was opened in 1923 and also records the names of those who gave their lives in World War II. Additional plaques for the Boer War, Korea, Malayasia, Vietnam and National Servicemen have been added and a Dedication ceremony is to be arranged. The Kurrajong men from Gilgai were Hector Moore, Frederick James Simpson, Leo Dane Thorne, Lachlan Walden, Edwin JH Borwn, John H. Stone (KIA), and Edgar L Woodford (KIA).